We all know the drill: Prospective students spend months painstakingly deliberating over which college they want to go to, visiting the websites of potential schools, and weighing up the pros and cons. For prospective students, college websites are a fantastic resource packed with information about everything from course information to financial aid. But if you’re a school trying to attract new students, the vast majority of people who visit your website are “drive-bys,” i.e. the 98% of people who visit a website for the first time and leave without taking any action. This is where remarketing comes in. Fortunately, with remarketing, it’s possible to get these prospective students back to your website and have another go at making a second, third or even fourth impression. If you’ve ever had an ad for a particular product follow you around the internet, you know what I’m talking about: that’s remarketing. Remarketing is a highly effective tactic that gives you a second chance at marketing to people who have already expressed an interest in your school — they visited your website after all! — but, of course, are also checking out your competition. It involves tagging your site visitors with a cookie and targeting them with advertising content across their different devices after they leave your website. How Can Remarketing Work for My College? Let’s get into the nitty gritty of how remarketing works. It all starts with tracking tags, or cookies, that you add to the pages on your website. When a prospective student visits your site, they pick up your cookie, and then when they visit other websites associated with the ad network you are advertising with (say, for example, the hugely popular Google Display Network), your ad will appear on the page they’re looking at. For example, a prospective student might visit your website to find out more about financial aid and scholarships and pick up your cookie. Later, they might be watching a YouTube video, reading the news or just generally surfing the web… and then there’s a photo of your school in a banner ad along with a call-to-action gently (or even aggressively, if you decide to go down that road) reminding them about the financial aid calculator on your website. 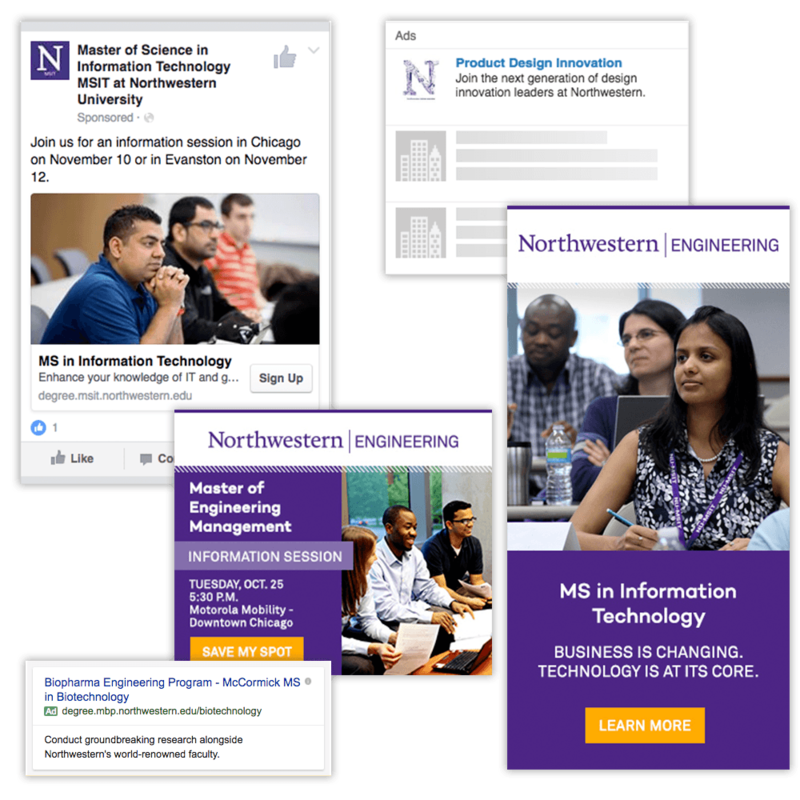 In these examples, you can see how Northwestern University, a customer of Pagely, uses a mix of Facebook, Google Display Network and Google Adwords to reach prospective students. According to Hubspot, on average, you’ll be able to connect with 84% of the people you tag, 10-18 times per month. Also, gone are the days when prospective students would spend solid chunks of time on their desktop computers researching universities. Nowadays, they’re shopping in “micro-moments” — checking their phone while commuting to school or swiping while standing in line. In fact, stats show that 90% of smartphone users use their devices to make process toward a long-term goal while out and about. The benefits of remarketing for higher education institutions can’t be understated, especially as schools attract huge numbers of visitors to their sites as part of a long conversion cycle, not to mention the significant cost involved. According to Helix Education, one of its client institutions experienced a 25% increase in its overall enrollments, after a two-year period, directly from remarketing. Even if prospective students don’t actually click your campaigns, your ads go a long way to creating brand awareness in the early stages of researching schools and gathering information thanks to the “billboard effect.” As students surf the web and see your school’s ads, they’ll have greater brand recall. Hubspot has also found that conversion rates on remarketed ads are up to 400% more effective than traditional PPC ads in some industries, and with an average of half the Cost Per Click (CPC), return on investment is generally higher. There are two powerhouse advertising networks when it comes to remarketing: Google Display Network (GDN) and Facebook. You’re pretty much guaranteed to reach your target audience by running a remarketing campaign with just GDN and/or Facebook. GDN is one of the largest remarketing networks in the world with more than 2 million websites reaching 90% of worldwide users, and Facebook has 2 billion monthly active users. So chances are high that prospective students will see your ads served by either of these two platforms somewhere on the web during their day-to-day web surfing. Let’s take a look at how they both work, as well as the pros and cons. What’s the Google Display Network (GDN)? Google Display Network ads appear on more than 2 million websites. Image credit: Google Adwords. GDN can help you reach prospective students who have visited your website before by showing them ads as they browse websites that are part of the Google Display Network, or as they search for terms related to your school on Google. With GDN, you can make your remarketing campaign quite specific, for example, creating campaigns that target viewers who have not only visited your site, but also browsed your page detailing your business program options. If the prospective student clicks on your ad, they’ll be taken to a page you’ve specified on your website and you’ll be charged for the click, just like you would for search ads. To use remarketing on the Display Network, log in to your Google Adwords account and choose Display Network only > Marketing objectives > Drive action > Buy on your website when you create your ad campaign. Then you need to add the remarketing tag on your site. It’s just a small snippet of code that you can get from AdWords. Next, you’ll need to create a remarketing list. For example, you could create a remarketing list for visitors to your most popular course information page. The remarketing tags tell AdWords to save visitors to your “popular course page list.” Then when prospective students visit that page, their cookie ID is added to the remarketing list you’ve created. 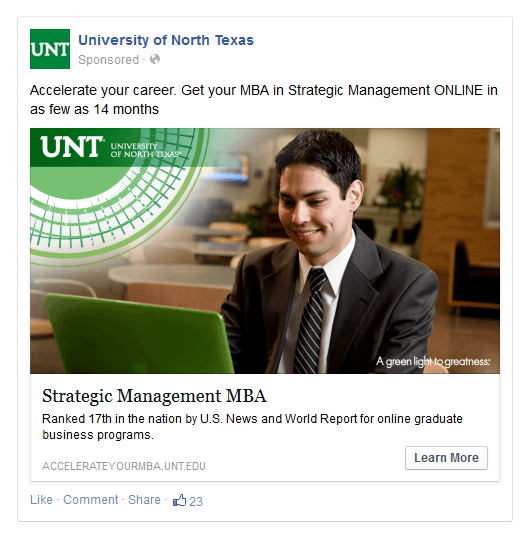 An example of a targeted Facebook ad using Custom Audiences. Image credit: University Relations, Communications & Marketing. Facebook remarketing works in a similar way to Google Display Network remarketing, but instead of showing your ads across websites within the GDN, your ads are shown on Facebook using “Custom Audiences.” The basic idea is the same: someone visits your site, they’re tagged with a tracking code, and then while they’re scrolling through their Facebook feed on their computer or mobile, your ads will pop up to remind them about your university. Facebook’s Custom Audiences features lets you set preferences for remarketing to different segments. For example, you might want to remarket to people who visit the undergraduate admissions page on your college’s site. Anyone who visits this page but doesn’t make an inquiry or subscribe to a mailing list could then be shown an ad on Facebook with a photo of your campus, encouraging prospective users to click through to find out more about your admissions process. I like how WordStream compares Facebook remarketing to dating. You’d be more comfortable going on a second date with someone you’ve already had a nice time with rather than a blind date, which is more intimidating and the chances of meeting a dud are much higher. The same goes for advertising. If someone has already visited your site, the chances of them interacting with your ad and clicking through to find out more about much higher than if they saw a random ad for the first time on Facebook. In fact, Facebook remarketing ads get three times the engagement that regular Facebook ads do. Here are more tips on higher education marketing to millennials. Segmenting your audience using demographic, geographic and intent-based information enables you to serve different audiences with contextual, personalized ads. After all, prospective students who visit your site will be looking for different types of information and your remarketing should take these differences into consideration. For example, if some prospective students have only visited your homepage, you could show them general ads that focus on building brand awareness. And for others who visit specific pages on your website, like the landing page for your engineering faculty, you could serve them tailored ads that encourage them to find out more about your undergraduate programs. Image credit to Allie Wassum, Social Strategist. 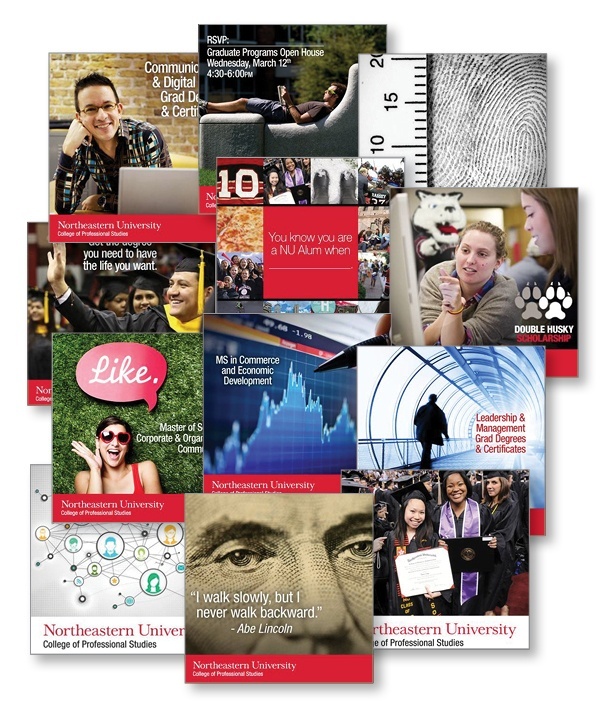 Northeastern University, a Pagely customer uses various image ads to speak directly to different segments of site visitors. Just because a prospective student has visited your admissions page once doesn’t mean they want to start seeing your ads everywhere they go online. Overexposure and ad fatigue can be damaging, so it’s a good idea to set frequency limit for your ads. Having said that, WordStream believes the whole remarketing “creep factor” is ridiculously overblown. After looking at thousands of display ads and comparing the impact of ad fatigue on remarketing display ads vs non-remarketing display ads, they found so-called “creepy” remarketing ads fatigued at half the rate of non-remarketing targeted ads. Interestingly, users are interested in remarketing ads twice as long as regular display ads and convert at higher and higher rates with each incremental ad view. ReTargeter recommends displaying 17-20 ads per user per month, but it’s a good idea to test what number works best for your school’s advertising. The copy you use and the design of your ads are, obviously, major factors that influence whether a prospective student will click your ads. A/B testing different variations can help you identify which design and copy combinations have the greatest impact so you can make data-driven decisions on future ad copy, design, CTAs, and ad placement. Don’t forget to AB test different types of incentives offered through your ads, too, and find out which ones are the most popular with your audience. ReTargeter also recommends rotating your ads so you’re not constantly using the same designs. A ReTargeter study found that clickthrough rates decrease by almost 50% after five months of running the same set of ads. After seeing the same ads again and again, ads are more likely to blend into the background, so be rotating your ad creative every few months you can avoid these performance dips. Prospective students typically apply to anywhere from one to 15 colleges and research countless more before narrowing down their lists and usually need to be exposed to a college program several times before deciding to submit any information to start the inquiry process. By keeping your ads in front of your audience, you’re reminding them of their interest in your school and you can entice them to come back to your website for more information. Remarketing creates opportunities for you to personalize interactions with college-bound students, allowing you to serve up ads based on their specific needs, ensuring students don’t forget your school during their months-long search for their perfect school. Want to know more about optimizing your school’s online presence? We help Higher Education clientele scale to meet the demands of digital learning. Become one of the many higher education institutions that trust us with their WordPress hosting needs. We’re a high-end boutique that has worked hard to earn our keep. Learn more here. This post belongs to our Higher Education and WordPress content hub with other posts, pages, and case studies. Explore our Higher Education and WordPress content hub. A copywriter, copy editor, web developer, consultant, course instructor and founder of WP Pros(e), Jenni McKinnon has spent over 18 years developing websites and almost as long for WordPress. A self-described WordPress nerd, she enjoys watching The Simpsons and names her test sites after references from the show.